The I only went out for a couple of meals last week. Both were at the V&A! 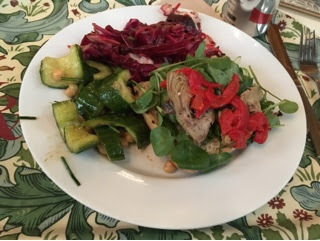 The first one I had Artichoke Bruschetta with Cucumber and Chickpea Salad and Beetroot and Radicchio Salad. Yummy and fresh. I also went to Comptoir Libanais for lunch with my mum, we had a dips platter, falafel (which were huge), a halloumi manou'sha and some kibbeh. It was ok, the food wasn't as good as other Lebanese I have had but it was passable. Next week, I'm meant to be going to the theatre on Monday, but the tube strike has put the end to that. Then next weekend I'm going to on a retreat in Tunbridge Wells. I'm really looking forward to some me time.